In this Kitchen Nightmares episode, Chef Gordon Ramsay visits Fuengirola, Spain to help Mayfair Restaurante, run by South Londoner Pat and her Spanish husband Jack. They met whilst Pat was on holiday, settled in England but moved back to Spain 28 years ago. Gordon finds broken freezers, a room full of clutter and the restaurant has been restricted in size to make room. Pat reveals she has sold her house and is using money from the sale to support the business. The tapas counter has raw and cooked meat stored next to each other and fresh produce is on top of old produce. Gordon orders the kitchen and restaurant to be closed and John is frustrated by the state of the kitchen. Gordon comes back the next day and Jack has cleaned the kitchen. Gordon sits down to order some food, he orders a tortilla, the potatoes taste rotten and microwaved and the fish dish with calamari and squid is rubbery and sloppy. Jack takes over in the kitchen and serves Gordon a 2 day old chicken. Gordon orders John to taste the sauce and he finds it revolving, Jack tastes it and calls it salty. Gordon puts down a line and tells Jack he isn't to enter and if he crosses the line he'll put him in the sea, John is to run the restaurant and Juan is not to use a microwave. That evening, Jack is out front charming the customers but the kitchen is falling apart with Juan overcooking meat. Jack refuses to sack Juan as he feels sorry for him and the customers aren't happy with the wait and substandard food, some left without paying and John is furious. John runs a car rental firm and Gordon visits but John is losing money and the cars are falling apart. His parents gave him 40,000 euros and Gordon tells him to sell the business to pay them back. Gordon orders them to declutter the restaurant but Jack struggles to let go. With the clutter gone the restaurant has doubled in size and Gordon reveals a new sign, the restaurant is to be a fried chicken shack. The restaurant has been repainted and extra tables have been added. Gordon shows them how to make fried chicken and the family love it. There are sauces and salads to upsell to help boost income. Jack, John and Pat are sent in the town promoting the restaurant in chicken suits and a new chef has been hired, Juan is demoted to pot washer. On opening night, there are all hands on deck, the kitchen is prepared but front of house have given big orders to the kitchen at once. Gordon orders them to stop taking orders for 5 minutes. Gordon despairs as Jack returns to the kitchen with raw chicken and he orders them to slow down and work as a team. John steps in and supports the kitchen and the kitchen runs smoothly. The customers are happy with the food despite the wait and they have made over 700 Euros. Gordon returns to the restaurant 4 weeks later and they have kept the chicken theme. He arrives at lunch time and the restaurant is busy. Juan has left and the kitchen has kept up the cleaning regime. They are averaging 500 Euros a day and John has sold the cars but hasn't repaid his parents. John writes an IOU to his parents and it is put inside the till. In the 3 months prior to airing, they are averaging £1500 a week, John has sold 2 cars and still hasn't paid his parents back. The owners have reported since that both customer satisfaction and sales are up. Jon has since reverted to his own recipe and told the Mirror in October 2014 that he was losing £2500 a month. "my girlfriend and I went in June, a few weeks after filming finished. The food was not bad, looked like they'd taken inspiration from Nandos a bit. We weren't aware at the time who Jack & Juan were but turns out they were the two guys hanging out at a table making the place look untidy! John (the son) served us and he was pleasant enough but we seemed to sense some tension between Jack and him. John said something at one point in Spanish that mentioned "Chef Ramsay" delivered in a passive aggressive tone! We sat outside but was very quiet for an evening, didn't venture inside but wish I had after last nights viewing!" 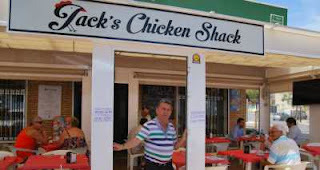 Jacks Chicken Shack was aired on 23 September 2014, the episode was filmed in May 2014 and is Costa Del Nightmares episode 1. I'm curious. Is "Costa Del" the one-off series that is the finale to the Kitchen Nightmares franchise, or is this re-brand a way for GR to get complete control of the KN concept away from Optomen? I'm an American and I watch the show on BBC America. I'm just glad that there are not going to be any further episodes made in the U.S. because they are either done by the owners for publicity and new equipment or the owners are so incompetent that they would mess up a lemonade stand and are a complete embarrassment to the restaurant industry.